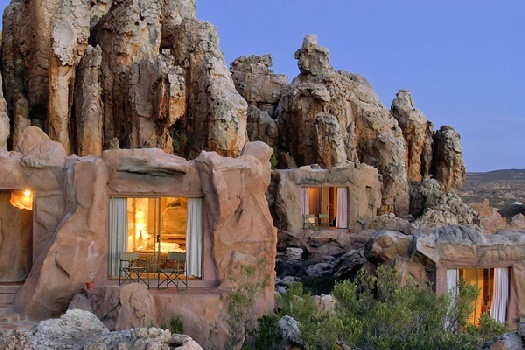 Kagga Kamma Nature Reserve is concealed in a spectacular rocky wilderness to the south of the Cederberg Mountains, bordering the Ceres Karoo. View ancient Bushman rock paintings several thousands of years old, enjoy guided game and nature drives with scenic sundowner stops, as well as hiking and star-gazing at a mini-observatory. Stay in charming circular huts or cave rooms built between massive sandstone rock formations, or at the unique outcrop room which offers a luxurious open-air sleepout. There's currently no specials at Kagga Kamma Nature Reserve. The conference facility at Kagga Kamma is situated at Bushman Lodge. It is an air-conditioned facility that accommodates up to 25 delegates. Wonderful outdoor activities are available between sessions. Lunches are served in "Die Rotskombuis" Restaurant and dinners in the lapa or restaurant. The venue is equipped with overhead projector, white board, flip chart, TV & video recorder, microphones, projector, screen and stationery.There is satellite internet access and Wi-Fi.